I am the maker of the secrets of the two horizons. I aim the maker of the hours, the creator of days. I am the creator of living flame. I am Khepri in the morning, Ra at noontime, and Atum in the evening. At this moment the pain grew worse and Ra God realized that the time had come to give up something of him in order to find peace. He took Isis aside where the others would not hear and the two began to bargain like merchants in a bazaar, but Ra God was in too much pain to bargain well. Isis demanded that he take an oath to give Horus, her son, his two eyes the sun and moon. He agreed and whispered the secret name. She was faithful to her bargain and issued the proper cure to relieve the pain: “Depart, poison, go forth from Ra God. 0 Eye of Horus, go forth from the god and shine outside his mouth. It is I who work; it is I who make the vanquished poison fall down upon the earth, for the name of the great god has been taken from him. Let Ra God live, and let the poison die! Let the poison die, and let Ra God live!” She, of course, never revealed the secret name since she had no desire to share her new-found power with anyone else, and so this special name remains hidden from all mortals and gods to this day. Isis finally did not use the power for her own sake, but to increase the power of her son. 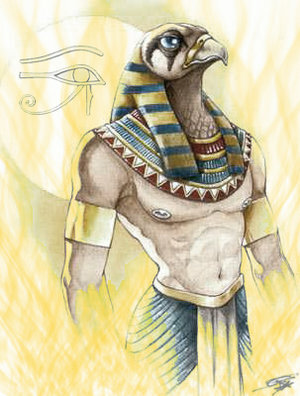 Horus replaced his great great-grandfather as the sun god once he had the eyes for his own use. The Eye of Ra God became the Eye of Horus and the elderly god was given a graceful retirement in which he was revered as the creator of all things but did not have daily responsibilities. Among many early societies it was thought that the real name of a person or god was essential to their existence. This name was the key to their being, for without a name nothing exists. To know the name was to have power over the creature, and the myth of Ra God and Isis was told to illustrate the importance of keeping one s true name secret, or at least reserved for special occasions. Mi accordance with this belief, ancient Egyptian kings always had several names. One of them would probably be compounded with name of a god and would be used only in religious context monuments. The cartouches of the kings, therefore, may reveal several names, one being reserved for religious purposes. In connection with this myth, too, we may note that the Egyptians did not think of their gods as creatures who freely gave of themselves to the human beings for whom they were responsible. Their gifts-eternal life, for instance-had to be exacted by force, and it was therefore necessary for mortals to gain some sort of power over the gods in order to obtain unusual blessings. One way to this power was the secret name. This myth has survived in two papyri, one at Turin and the other in the British Museum. The one at Turin, which has been translated by M. A. Murray and E. A. Wallis Budge, dates from the Twentieth Dynasty (about 1200-1085 B.C.). The version given here was based on Murray’s, but it has been modernized and references to Budge’s version have been used to expand it. This tale was originally told to illustrate the value of curses against serpents, and the text presents magic formulae to cure snake bites. The magician was probably supposed to recite the tale in the hope that the words of magic which could cure a god would have the same effect on the human patient. The original text tells us that these magical spells were to be spoken over images of Atum, Horus, and Isis in order to cure the stricken person of the serpent’s poison.